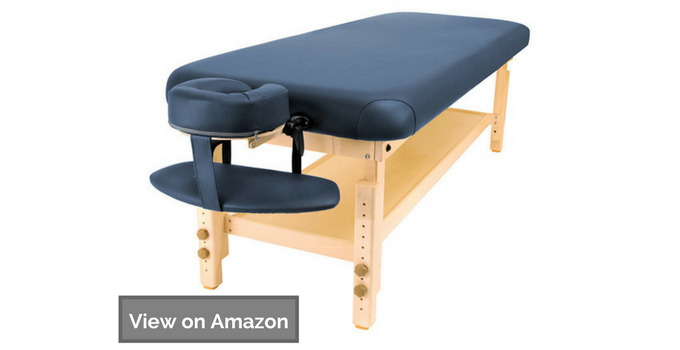 When you’re in the field of massage and bodywork, owning a high-quality massage table is a must. It’s one of the more significant investments that you’ll make in your business outside of your massage school training. 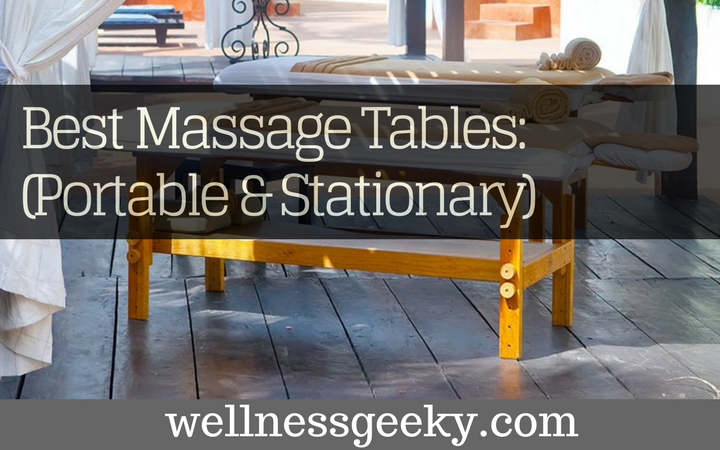 As a massage therapist, you want your clients to be as comfortable as possible, so having a table that helps to achieve a relaxed state is essential. Even though it’s a significant purchase, it’s one that is often rushed and overlooked. 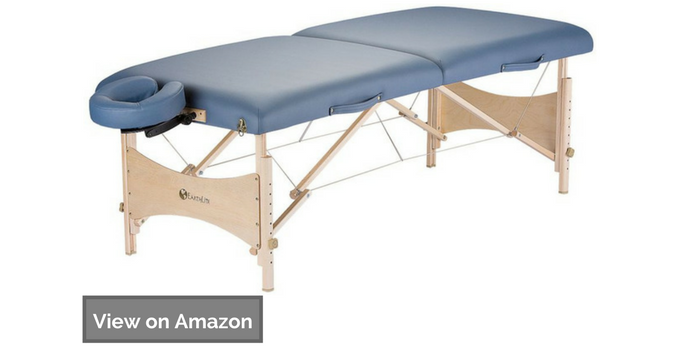 Finding the best massage tables for sale can be confusing, especially if you are new to the field and haven’t experienced a range of different options. So products are so poorly made (such as this junk Here), that you do not want your clients even get close to it. When you’re looking at massage tables, there are a few things you’ll want to consider, as they will make an impact on which one you purchase. You’ll want to think about where you practice your massage and if there are any space constraints, as well as how difficult it will be to move the table from that space. You’ll want to think about the clients you serve, and if they have any special needs regarding table height, material, etc. Here’s a look at the best tables on the market, both portable, and stationary. Check out our table reviews below. What is the average size of a massage table? What can make a massage table more comfortable? How long does a massage table last? What is the difference between the working weight and static weight? Which features are essential in a best massage bed or table? What kind of foam is best for a massage table? Topping our list is Master Massage Santana Therma. It’s the best portable massage table on the market and has several features that set it apart from the rest of the pack. First and foremost is its size. Typically, a portable table is going to be smaller than its stationary counterparts. However, that isn’t the case when you purchase the Santana Therma model. It’s a full 31 inches wide and is extremely comfortable to lay on. The foam padding, which includes a layer of memory foam, is much like laying on a high-end mattress. Your clients will feel an immediate warm, soothing feeling as they lay down because this table features a heated tabletop! Much like the seat warmers in a car, these warmers take that chilly edge off the cold fabric. 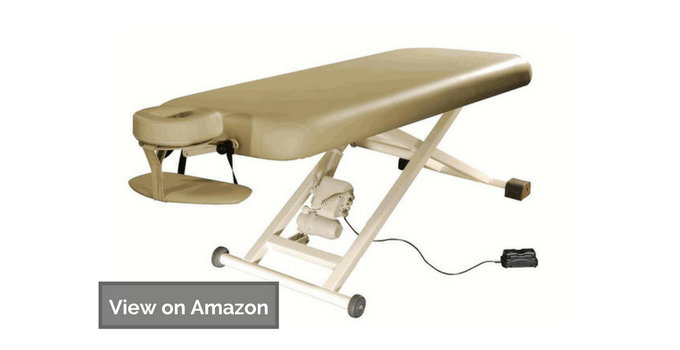 A massage table, while essential for massage therapy, can be expensive. Not everyone has the budget for a high-end table right away when starting their career. If that’s the case, the Sierra Comfort All Inclusive Massage Table is for you. It’s portable, light, and comes with everything you need to get set up and started. Among the accessories, you get to this table are sheets, a bolster, a table bag (carry bag), a face cradle, and a pouch for any massage or essential oils. Sierra makes it easy. 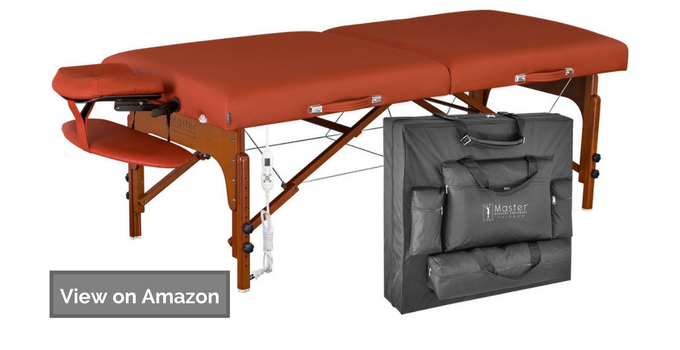 With the most brands, when you buy a portable massage table, you still need to purchase additional accessories. 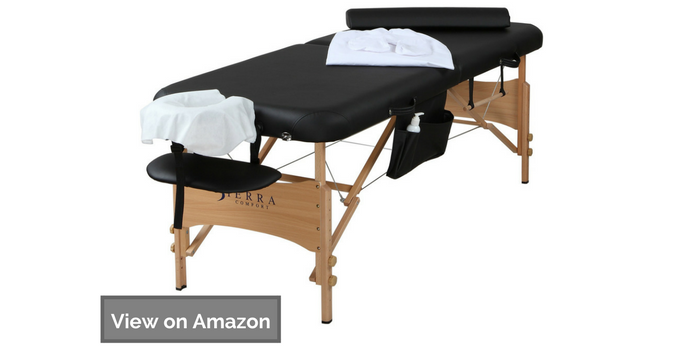 When you are investing in the Sierra Comfort, you’ll have everything you need to begin or grow your massage business. Another good portable massage table option on our list is the Earthlite Harmony DX. This table lets you show a little more personality, as it’s available in a variety of colors such as black, teal, burgundy, and mystic blue. The Harmony DX is well constructed, but at only 33 pounds, it’s one of the lightest tables on the market. The finish on the wood of this table is beautiful, and something you’ll be proud to have on display. The table comes with an adjustable headrest, as well as a face cradle. When you’re ready to take the table elsewhere, it has a carrying case that will make your life easy. If you’re always on the move, this table is an excellent choice. Some table reviews have mentioned discomfort when carrying the table bag by its handles. If a stationary table is best suited for your work, then the Master Massage Laguna Stationary Massage Table is an excellent choice. The table comes in two different widths, being either 30 or 31 inch wide. This model is much more massive than any of its portable counterparts. You’ll be able to adjust the height of the table to accommodate any needs your clients might have, and it is 88 inches in length. It is a bit longer than many of the other models on the market, so be sure you have the room to accommodate it. Users of this table often remark that despite its size, it is easy to put together, so if you’re not exactly a do it yourself kind of person, this might be a good option for you. Some reviewers have complained about its lack of sturdiness. The Earthlite Sedona is a stationary table that comes with added convenience. That added convenience is that it’s already assembled when it ships to you, so there are zero headaches when trying to set it up. It also has an optional storage cabinet that is great for storage. The table is sturdy, weighing in at around 100 pounds. It features an adjustable height, from 25 to 34 inches off the ground. It is an excellent option if you are in an office where many therapists use the same table. You can purchase this table with a power-assisted tilt option, or in salon trim that features armrests and a variety of other amenities. Another reliable model is the Spa Luxe stationary electric massage table model. One feature people love the shelf on the bottom of the table, which is a great storage space for sheets, towels, and other accessories. This table comes with a sand-colored top, and beechwood bottom, so it matches pretty much any room decor that you would want to pair it with. It weighs just above 100 pounds which are comparable to most other models. Spa Luxe offers a great warranty, providing five years on the frame, three years on the upholstery and one year on the mechanics of the table. As a massage therapist, your clients are your livelihood. Having a table that your clients feel relaxed and comfortable on is a necessity. A massage table is an expensive investment, but a worthwhile one. One thing that many people consider is buying a used massage table, which while it can be a great way to save money, also comes with some risks. With used tables, you don’t ever truly know how the table was used, and don’t want to put your clients at risk. Before investing in a new table, it’s important you ask the right questions, and get those questions answered.What is the weight limit for massage tables? The weight capacity of tables varies and depends on the size, shape, and materials used among other things. In general, a massage table holds between 600 and 1200 pounds while working. Be careful when you’re on a budget, as cheap tables often have lower weight capacities. Portable tables will typically hold less, which is a trade-off for being lightweight and quickly set up and taken down. Be sure that whatever table you select has an appropriate weight capacity for your work. Massage tables vary in size, which means you may need to take some measurements to figure out which size will work best for you and your clients. In general, tables are 28 to 35 inches wide. They are usually 20 to 36 inches tall. Typically, the width of the table is non-adjustable, but the height is (good adjustability). A massage therapist should buy a table that is about as high as their hips. It can be a challenge to find taller models; they are out there. Narrowing your search to 40-inch-tall tables should help if you are too tall for the standard sizes. Massage tables are not always as comfortable as you’d like. If that’s the case, and you want to make your clients feel more at home, you can purchase accessories like more comfortable headrests and face cradles. You can even get some fun colored headrests in bright shades of pink, yellow, or green! A table pad is another option to help increase the comfort of a table. If the foam on your table is not as cushion-like as you want (not enough cushioning), putting a table pad on can make a big difference. There are a variety of memory foam table toppers on the market that will make a world of difference for your clients. How long a massage table lasts depends on several factors. It is essential to take a look at the quality of the brand and the build of the specific model. When it comes to durability, you often get what you pay for with massage tables. Purchasing a table that feels like a great deal, only to have it start to come apart in a year or two, is anything but a great deal. Investing in a quality table that will last several years is the smart way to go. As you probably noticed from this buying guide, we highlighted both the working weight and the static weight of each table. It is essential to keep in mind because the two numbers mean entirely different things. You may need to have a few options for your clients because not all models can accommodate all weights. The working weight of a massage table is how much weight it can hold while in use. The table will naturally flex as you apply pressure to your client’s body. The working load is 25-50% of the static weight. A higher working weight might be needed when you are doing deep tissue massages, due to the massive pressure that you apply. The static weight is how much weight a massage bed can hold when it is completely still and not in use. Think of it as how much weight the table could carry if you were placing an inanimate object on it, and not moving it. As soon as you apply pressure or cause the table to flex at all, the static weight switches to working weight. There are plenty of features to consider when it comes to making any purchase. It is especially true of massage tables. They are a significant investment, so it’s important to do your research. Not all of these features will be available on all massage therapy products, so it’s important to know yourself, and your clients. Portable or stationary: In our list, we shared both portable and stationary tables. Which one you choose depends on what type of practice you run. If you only make house calls, you will want to buy a portable table.If you work in an office, you can buy a stationary model. They are sturdier, but cannot be easily transported. Some professional therapists purchase both types so that they can offer both house calls and office visits. Comfort: Your clients are relying on you to make them more comfortable than they were when they walked in. You also need to give them a comfortable and relaxing place to lay during their appointment. You’ll want to buy a model that has adequate foam luxury padding. If you end up buying one that isn’t as comfortable as you expected, there are additional accessories you can buy, such as extra padding, adjustable face rests, and more. Ease of assembly: Though you may not be taking your massage bed or spa bed with you, you still want to find one that is easy to assemble. It takes away the stress of putting the massage table together when you first get it, especially if you don’t have the necessary tools. It can also be helpful if you decide to rearrange your office or move to a new location. Accessory compatibility: There are many helpful add-ons you can use with your massage table. One thing to be aware of is that some brands only allow you to use accessories made by them.It’s important to do your research and make sure that your desired accessories work with your particular model. Usually, things like foam pads can be used universally. Other items, like an armrest, may require a specific type of table. Ease of cleaning: When you are seeing multiple clients right in a row, you may not have time to scrub your table. Look for materials that can easily be wiped down and do not require a sophisticated process if you spill oils or anything else on them. When you’re looking at massage tables, aside from the durability, the foam padding is the most critical aspect. Beyond the foam, you can add additional padding for clients that need it. Memory foam is a popular choice. It is one of the best foam options because it is thick. It is known to provide an impressive amount of comfort without being flimsy. Companies like Earthlite have come up with their own specially designed foam padding options. One of their more well-known products is the Strata table topper. It can be used on top of most tables or even on the floor. The topper made from a combination of both memory foam and Q foam. The best choice is to find a massage equipment that you find comfortable that features memory foam, or a memory foam blend. If you have a large office, having models with different types of foam can be a great option. Earthlite was founded in 1987, and it is one of the best massage equipment companies in the world. Over the years, Earthlite has been the recipient of many awards. It also boasts exceptional customer service ratings from its customers. The company is a strong supporter of environmental efforts and displays that through their products and their manufacturing. They offer an impressive range of massage tables and accessories. They are also made in the United States, and their products are “built to last a lifetime,” which is why they offer such extensive warranties. They believe in taking care of the environment as well as clients’ bodies. Earthlite also offers professional table packages. Oakworks massage tables started to built them over forty years ago. Linda and Jeff Riach founded this company maintain many of the core values that have helped it achieve success. They are aiming to give their customers safe and comfortable equipment that is reliable to use. They hope to take care of the well-being of people all over the world. The Oakworks facility located in Pennsylvania and this is where much of its production takes place. They have a strong focus on innovation and environmental concerns as well. Oakworks promises reliability in every single line one of their products. Brand pays a great deal of attention to an ergonomic design. Also brand manufactures good electric lift spa tables, reiki portable tables and hydraulic massage tables. Michael Friedman founded master Massage. Today, he is still the president of the company, making sure they are producing high-quality massage tables and other equipment. They are considered to be the number one innovator and producer in the world of massage tables. Since they originally opened their business, led by Friedman, Master Massage has grown to offer a vast range of different products. Master Massage is active in their leadership and wants to encourage its customers to have leadership abilities within their own companies as well. They hope to inspire their customers and help them along the way as they grow their businesses. Sierra Comfort Professional Massage tables began with the hope to create a diverse range of products for all of the different needs that need to be met in the massage therapy field. Their product line is guaranteed to work with therapists and medical professionals of all skill and experience levels. They hope to give customers a variety of products at an affordable price without compromising quality. Though Sierra Comfort has grown and now offers even more products than they started out with, they have maintained a strong, confident reputation. Customer happiness is one of their most significant goals, and they keep it as a top priority. Sierra Comfort also wants to make sure that their customers are knowledgeable about what they are purchasing from them and offer excellent resources when buying one. Stronglite Massage tables is a company that was founded over 20 years ago and have continued with their company mission of helping therapists all over the world. They are a trusted name and affiliated with the Earthlite brand. These two companies share some of the same guidelines and principles in their businesses, which adds to the trust that customers have for each of them. Stronglite continues to expand and adds more and more options to its line of tables and accessories. The Ironman Massage Table company has the motto that “Anything is Possible.” With this motto leading the charge, they have expanded their line of massage tables quite a bit over the years. They believe that anything is possible with their designs, and they love to inspire their customers to utilize creativity in using their products. They offer standard massage tables, but they also have an affordable line of accessories. OneTouch Massage offers a variety of different products. They feature well-built tables that stand the test of time. They also sell massage bolster pillows and face cradle covers that work on a variety of tables, not just their models. They are a one-stop shop for your basic massage therapy needs! Additionally, OneTouch Massage also offers reiki tables. When we talk about a being well-built and sturdy, what does that mean? Typically, it’s a reference to the materials it is made from. While the foam top is essential for comfort, the frame and legs are where the durability comes from. The two most popular frame material types you’ll find are aluminum and wood. Both offer some advantages and disadvantages compared to the other. You’ll typically find aluminum in portable tables. These tables are meant to be light and easy to transport, so using a material like aluminum makes more sense than solid wood. It’s recommended that you only consider aluminum if you’re using a portable folding massage tables. The downside to the lightweight is that aluminum is not as durable as wood. Aluminum table legs are hollow, and as such, they are susceptible to bending and breaking under heavy use. If you’re going portable, aluminum is the way to go. Wood is most popular in stationary tables because while it’s sturdy, it’s also solid and heavy. Because of this, it can typically handle a higher weight capacity than aluminum. When you have a wide variety of clients that come to your location, wood is best as you won’t ever have to worry about accommodating clients of different sizes. Tables feature different types of wood, and you can usually find one that has a stain or color that matches the space that it is going in. The one thing to know about a wood massage table is that it’s going to be heavy. You’re not going to want to move it once it’s in place. If you aren’t planning on moving your equipment, then wood is the best option. Being a massage professional therapist is an excellent career option for folks that love helping people feel more relaxed and refreshed. Like many careers, being a massage therapist comes with some inherent costs, and one of those costs is owning a pro massage table. While it’s a significant investment, it’s a necessary one, and we hope this guide helps you in making that investment. If you’re ready for you own best massage table in 2018, we highly recommend the Massage Master Santana Therma. It has all the features your clients will expect, and then some. 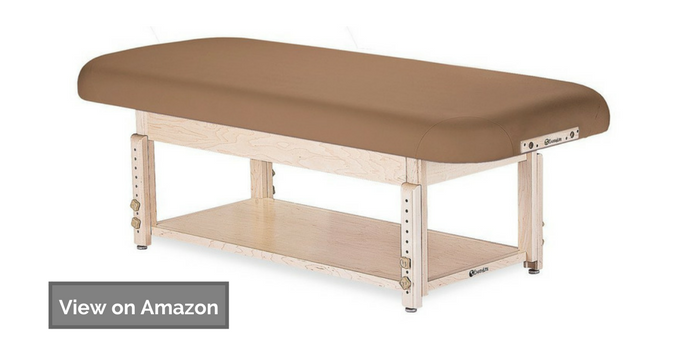 Step up your massage game with a new table today.